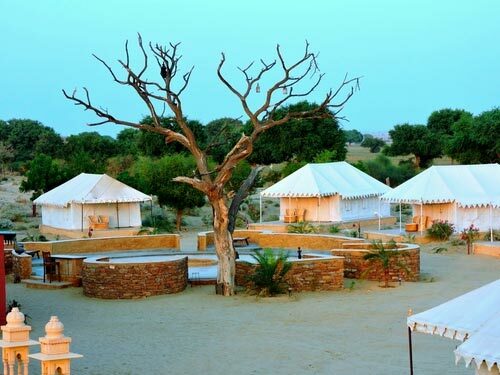 Set amidst Sam sand dunes of Jaisalmer, Damodra desert camp is a luxury tented facility that aims to make its guest fall in love with the raw realities of a desert. The desert camp offers an excellent opportunity for the urban elites to experience the colorful heritage of Rajasthan. 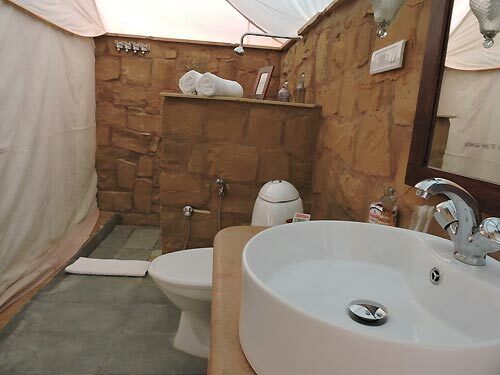 Blending the state of the art accommodations with the traditional themes of Rajasthan in terms of design, hospitality and cuisines, the camp has changed the dimensions of desert camping. The desert camp gives special emphasis on its day long safaris, which include scaling the sand dunes on a camel’s back or in a jeep. Besides, evenings at Damodra desert camp are spent dancing to the tunes of traditional Rajasthani music around the campfire. 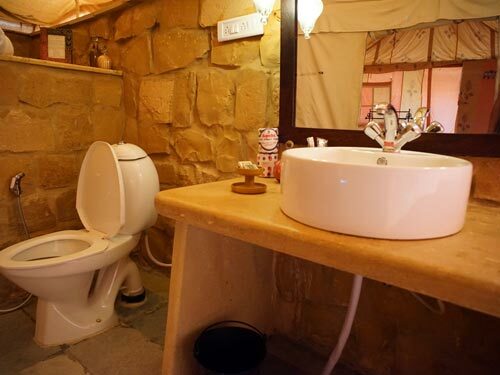 Damodra Desert Camp takes utmost care in making the stay of its guests high on comfort and luxury. There are a total of 10 accommodations-Deluxe Swiss tents available within the camp. Designed to give the guests a sweet taste of luxury in the middle of the desert, these tents are equipped with facilities of modern living. Guests at Damodra Desert Camp are offered traditional Rajasthani cuisines. Apart from Rajasthani and Indian, the desert camp also served yummy continental delicacies. The desert camp also offers its guests the luxury of dining under the twinkling stars with a soothing Rajasthani live music playing in the background. During the leisure time, guests at Damodra desert camp can have a nice read at the inhouse library. Based on the heritage and history of Rajastham, the library has a decent collection of books. Besides, the lounge and outdoor camp fire prove excellent for the guests to get acquainted with the others. Like the adults, kids of all age groups are welcomed at the luxury desert camp. For the extra beds, Damodra charges an additional cost from the parents. Desert safaris and cultural tours are delightful for the kids as well. Highly exciting and worth experiencing, the camping tour tends to educate the kids about the culture and heritage of Rajasthan, at the grass root level. Jaisalmer is an arid region in the state of Rajasthan. Being a part of the Great Indian Thar desert, the climates of the region are usually extreme. However, winters are always pleasant in Jaisalmer. Summers in this deserted area are usually very hot, with temperatures climbing till mid 40s at the daytime. Thus, the months between April and June must be clearly avoided for desert camping. Rainy season in Jaisalmer starts from July, but with less effect as the region’s geography does not allow the monsoons to rain much. However, from October, little chill starts developing, and the region becomes pleasant for outdoor activities. Winters in Jaisalmer usually start by mid November and continues till February. During this time, the day temperature rests within a comfortable bracket, while the night can get a lot cooler. Hence, the favorable time to visit Damodra desert camp in Jaisalmer is strictly between the months of October and February. However, Jaisalmer also has a comfortable weather in the month of March. Jaisalmer is a hot and arid place, attached to the Great Indian Thar desert. Thus, it is advised to keep a season check before making the plans to visit the camp. Besides, few items like sunglasses, hat and sunscreen lotion is a must to carry. 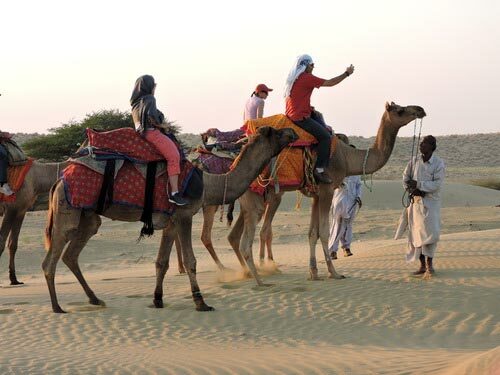 Being located close to the sand dunes of Jaisalmer, guests at Damodra Desert camp can embark on a camel safari. The safari tours are well organized and guided. While strolling in the desert, riding on the back of a camel, the tour can also lead to the nearby villages. Thereby, offering an excellent opportunity to mingle into the different shades of Rajasthan. As per the interest, guests can also opt for a jeep safari to ride over the desert. At Damodra, desert safaris are usually meant for one half of the day, but if you have a flare for these kinds of safaris, the tour can be stretched for a full day, but with an additional cost. Jaisalmer is home to some of the biggest sand dunes in India, as high as a skating ramp. With such dunes in proximity, guests at Damodra can indulge in sand boarding, which is emerging as a popular sport in the country. 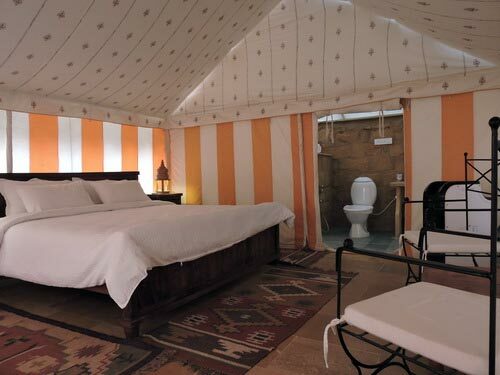 Damodra is a luxury camp that is located in the isolation of the Thar desert near Jaisalmer. Hence, in order to make his way to the desert camp, one has to travel to the city of Jaisalmer first, from where the camp is only 25 mins (26.6 km) away. The city of Jaisalmer is very well connected with the major cities of India, including Delhi and parts of Rajasthan. Popular trains running to this city are Delhi Jaisalmer Express, Howrah Jaisalmer Express and Jodhpur Jaisalmer Express. Jaisalmer has well maintained roads that connect to the major cities of Rajasthan. For the convenience of travelers, regular state transport buses from cities like Jaipur and Jodhpur towards Jaisalmer. However, there is also an abundance of private deluxe buses making their way to this city in the heart of Rajasthan.